Oh hi there...sorry I totally abandoned this blog. I'm honestly not sure where the time went! Seems like just yesterday it was March! Since I'm behind, I'm going to just do one catch-up post with my boxes from the last three months. For anyone who isn't familiar, Birchbox is a monthly subscription box service. It runs $10 (including shipping) and focuses on beauty - skincare, haircare, & make-up. I've been subscribing since last September, I'm a big fan of it. If you're interested in signing up, I would be grateful if you used my link as it gets me bonus points! August was a pretty great month for me. Birchbox has recently started doing a pick your sample program where you're able to choose one of about 4 samples they've pre-selected to appear in your box. I didn't choose one this month because nothing really grabbed me. Of course, I received one anyway - it'd be the Noir black eyeliner. It's the only thing I wasn't excited to receive - I don't wear black eyeliner because it's a pretty harsh look on me. I have to say though, I mentioned that I wasn't excited about it on Instagram and the company actually reached out to me to ask why - so props to Noir! I was excited to try the Amika dry shampoo as I've recently discovered dry shampoos and I'm in love. I can finally go a day without washing my hair and not have my hair be totally greasy! 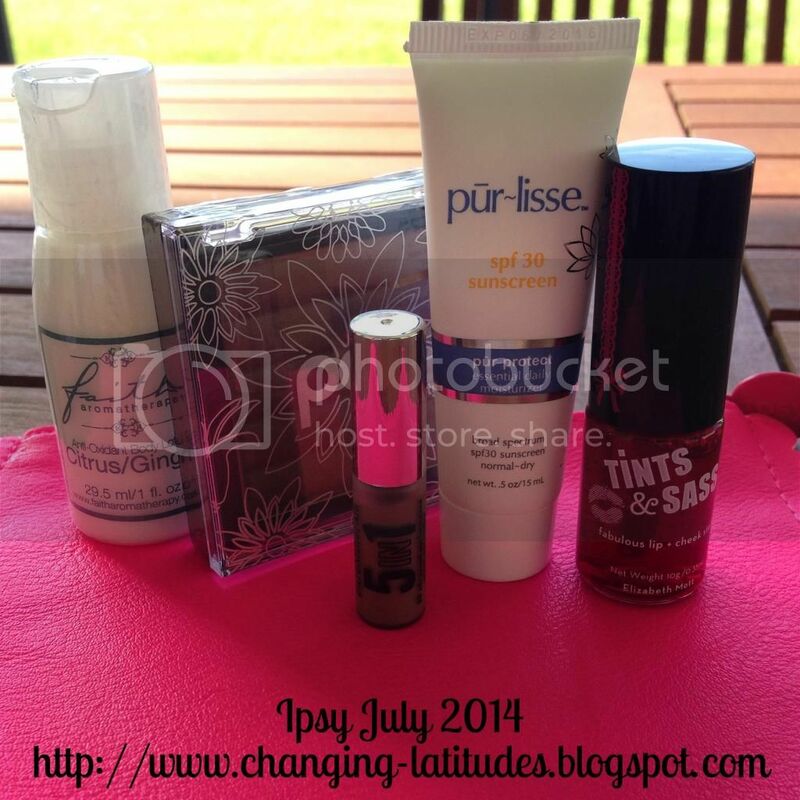 Wrapping up my Monthly Subscription fun for the month of July is my Ipsy bag! Spoiler: it's also the worst one this month...sad face. If you're not familiar with Ipsy, it's a beauty subscription that runs $10 and is sent out every month. It's focus is less general beauty and more make-up focused. You receive 4-5 samples each month (and sometimes full-sized items!) They have a point system for reviews, but it's pretty hard to redeem points without referrals - it's a nice extra, but it's not a reason to sign up for Ipsy. They also send you a make-up bag every month. This month, the bag was a neon pink, square, with a scalloped edge. Someone called it a bright pink ravioli and it's pretty accurate. Not my favorite. I'm on a roll - 4 posts in 4 days! (Okay, so I've set these all up on Saturday morning when I was being lazy...) I decided to treat myself this month and buy a whole bunch of nail polish. 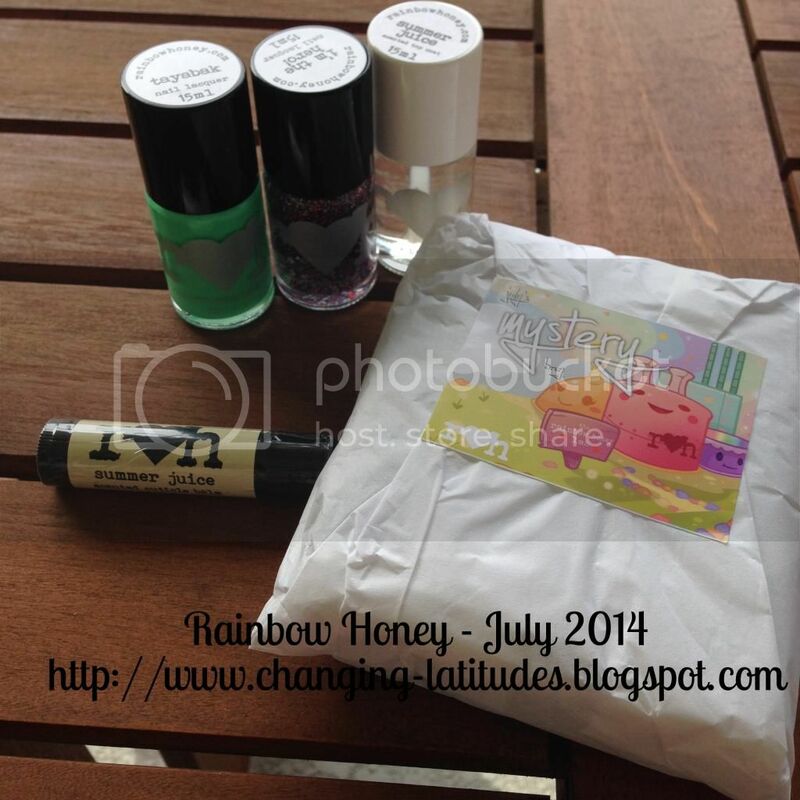 I bought some full sized polishes as well as a Mini Mystery Bag! 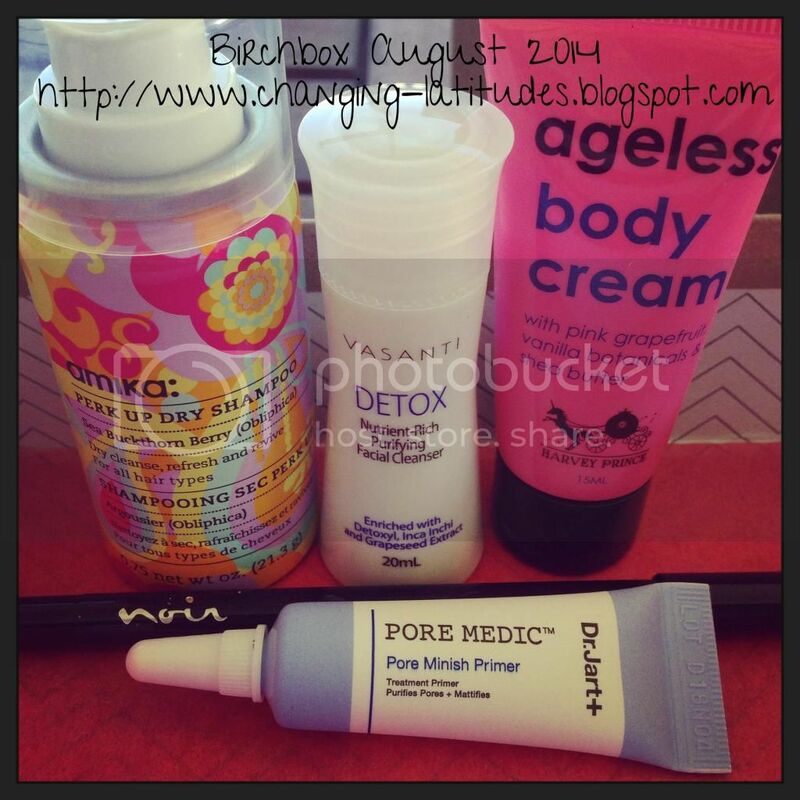 Spoiler alert: my Birchbox this month was amazing. Okay, now that's out of the way, back to business. 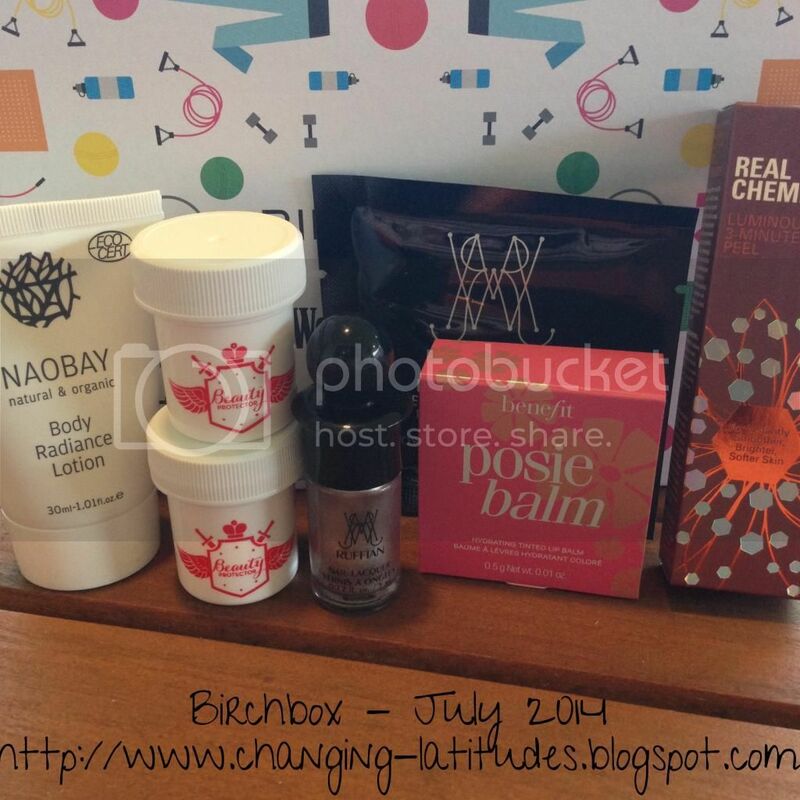 If you're not familiar, Birchbox is a beauty subscription box that arrives monthly. For just $10/month you receive 4-5+ sample sized items to try that are tailored to you through your profile. I've found some great things through Birchbox that I otherwise wouldn't have had a chance to try. Birchbox also has a killer point reward system. For all of your samples per month, you can review them for 10 points. Every 100 points gets you $10 off in their store to buy full sized items (you'll also earn points with every purchase you make.) I'm currently sitting at 385 points, they're burning a hole in my pocket! Ta da! Awesome box. One of the things Birchbox did in July (that they've done again in August) is allow you to choose your own sample. It was the first time they've done it, so there were a few hiccups in the process, but I got my top choice, so I was happy. You could choose between 3 different Ruffian Nail Polish Colors or 2 different Cynthia Rowley Lip Stains. I picked polish (to add to my growing collection) in Relic. I'm on the search for the perfect silver color to go with my Eagles green for the start of Football Season! A couple months ago I started participating on Influenster. It's a free site, anyone can sign up. The idea is that you do some product reviews, answer some survey questions, and then they'll send you a "VoxBox" to try new products that match your interests. They do require that you connect your Social Media accounts and share the products on those platforms. So these products I'm reviewing were free to me through this program. 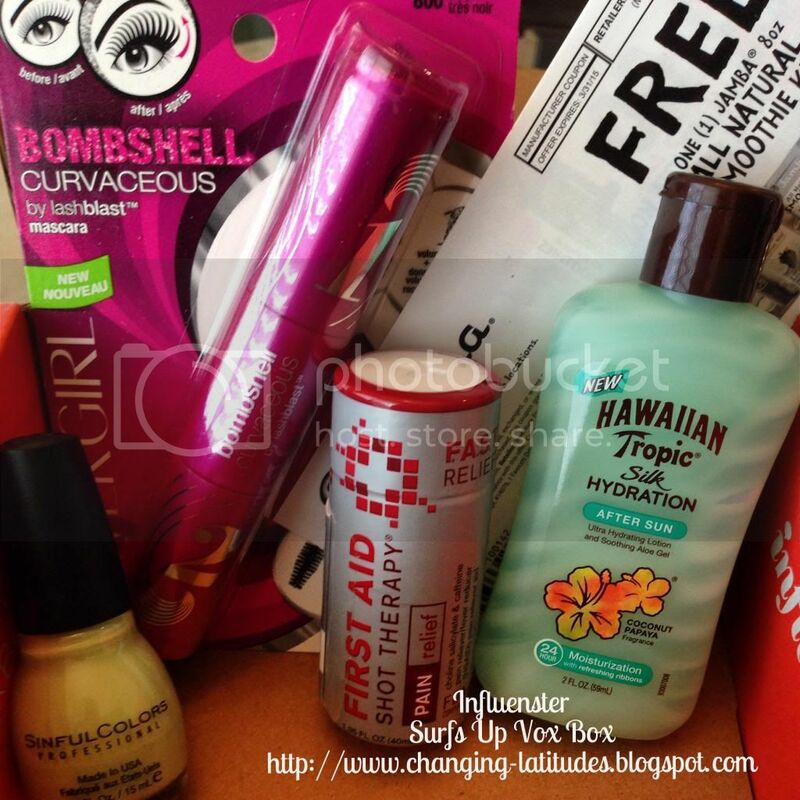 They were calling this the "Surf's Up VoxBox." Full of products that are perfect for the Summer. 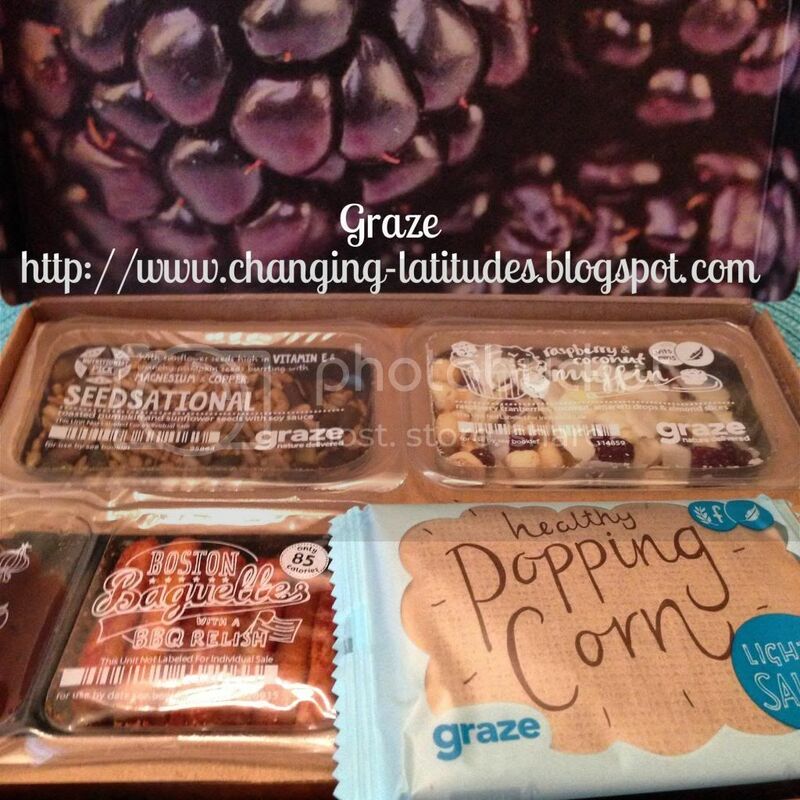 I've fallen a little behind on my Graze box reviews! I got a new one before I even posted about my last 2. Oops! Let's take a look at the past three boxes. If you're unfamiliar with Graze, it's a subscription box that comes either every other week or every week. We get it every other week, which seems to be the right frequency for us to have a nice treat every now and then. Boxes cost $6, if you use my referral link (above) you'll receive your first and fifth box free. While true customization isn't possible, Graze does allow you to rank snacks. Anything you mark as "trash" you will never be sent again (or for the first time.) They also have a section where if you're allergic or sensitive to certain products, you can go and trash all snacks in that category, though they do specify that cross contamination is likely. Starting from the top left, we received Seedsational, Raspberry Muffin (a repeat for us, Geoff loves it), Boston Baguette (breadsticks with BBQ dip) and lightly salted Popping Corn. This box was a big win for us, we liked everything in it. I really love their pop corn, it's a perfect size! Geoff got his first Birchbox in June. We were just going to do one month, but didn't cancel in time, whoops! So he also received a box for July. Turned out to be a pretty great box for him, so we're glad we missed a deadline. 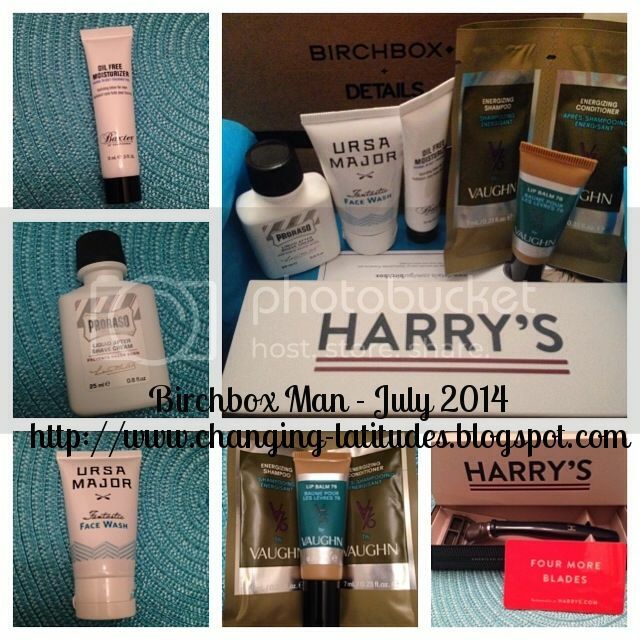 The Men's version of Birchbox is pretty similar to the Women's version. The biggest difference is the price - the Men's box runs $20 a month. Each month the Men's box includes a higher dollar value "lifestyle" item which account for the price difference. If you're unfamiliar with either version, Birchbox is a monthly subscription service. When signing up, you take a quiz that sets up your profile. The items they send you are based on this profile. (For example, if you are bald, you can mark it as such so they don't send you shampoo/conditioner.) What I love about Birchbox is the point system. You can earn points for purchases as well as for reviewing the items you receive each month, each review is worth 10 points and every 100 points earns you $10 in their shop! For Geoff's box this month, starting in the upper left, there's Baxter of California Moisturizer. Geoff really likes the facial scrub by Baxter of California from June's box, so this was a great item to receive. Next is the Proraso After Shave Lotion. Geoff had bought a different type of after shave product from Proraso recently, so he was happy to receive this to compare the two. It has found a new home in our travel sized product collection, so I think he liked it!